There is 0.0 mcg of Vitamin K in 1.0 cup (1 NLEA serving) of Frosted Flakes (Cereals ready-to-eat, KELLOGG'S, Reduced Sugar Frosted Flakes Cereal). You can have Frosted Flakes (Cereals ready-to-eat, KELLOGG'S, Reduced Sugar Frosted Flakes Cereal) without worrying about vitamin k.
How does the Vitamin K content in Frosted Flakes (Cereals ready-to-eat, KELLOGG'S, Reduced Sugar Frosted Flakes Cereal) compare with other foods? Here are some examples of foods that compare with Frosted Flakes (Cereals ready-to-eat, KELLOGG'S, Reduced Sugar Frosted Flakes Cereal). Fig.1. 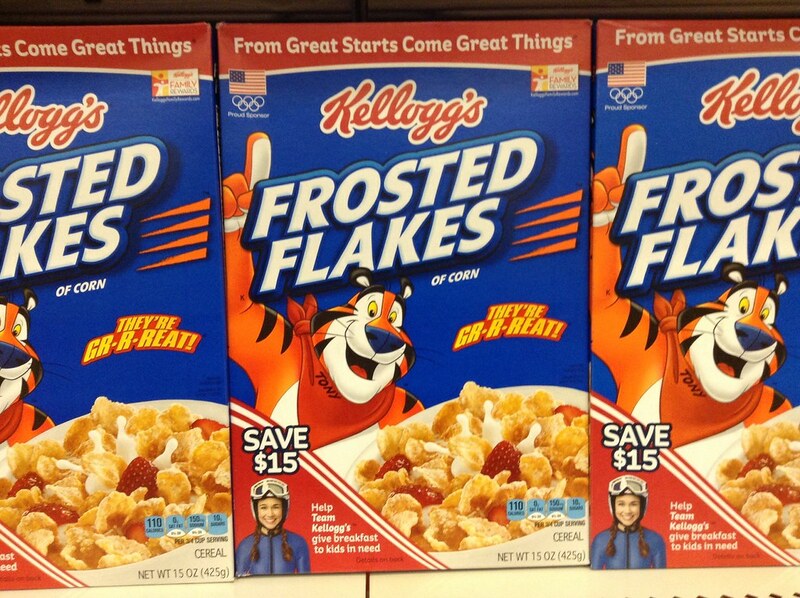 JeepersMedia, "Winter Olympics Sochi 2014 Kellogg's Frosted Flakes Box," Published February 26, 2014. https://www.flickr.com/photos/jeepersmedia/12801312253/. Accessed February 7, 2016. "Cereals ready-to-eat, KELLOGG'S, Reduced Sugar Frosted Flakes Cereal", NDB 8469, U.S. Department of Agriculture, Agricultural Research Service. Nutrient Data Laboratory. USDA National Nutrient Database for Standard Reference. Nutrient Data Laboratory Home Page, http://www.ars.usda.gov/ba/bhnrc/ndl. Accessed October, 2014.